Welcome, folks, to a very late edition of a #ShriekySunday. And yes, I know it’s March, but as long as I have photos to process of last year’s haunt visits, I’m going to keep posting about them! …along a spread out schedule. Tonight, we’re heading down south, to fabulous Laguna Beach, where we stopped by briefly last year when we previewed the Pageant of the Masters. 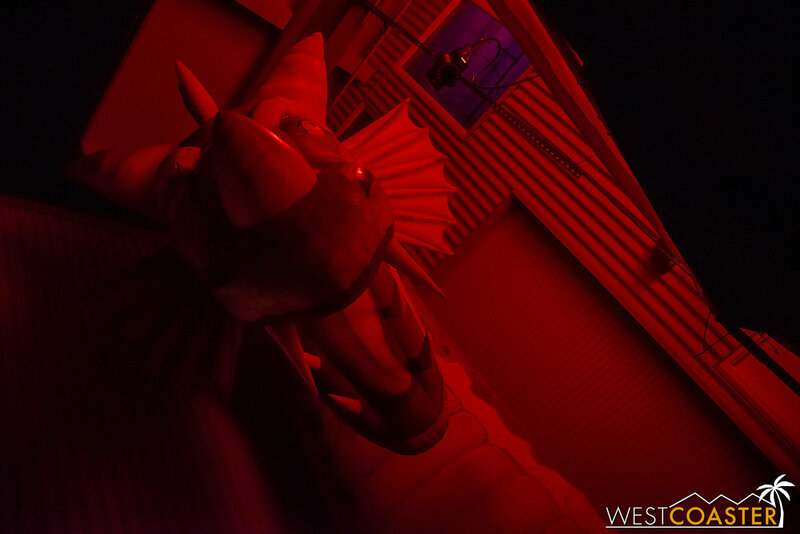 In fact, we’re stopping by the exact same location for a haunted attraction so exclusive it didn’t even happen last year… or the year before… or even the year before that. The last time this event even ran was 2013—quite a mark of exclusivity! Such it was that we had to visit when we learned of the Pageant of the Monsters (get it? 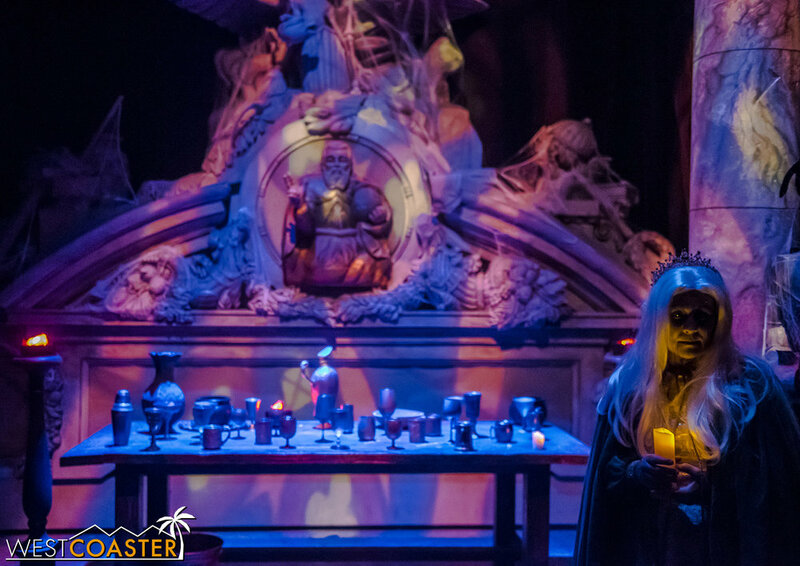 ), a relatively family-friendly haunted house experience that utilized recycled sets from some of the past Pageant of the Masters show to allow guests to traverse through the backstage area and take in a haunted house attraction of epic proportions! 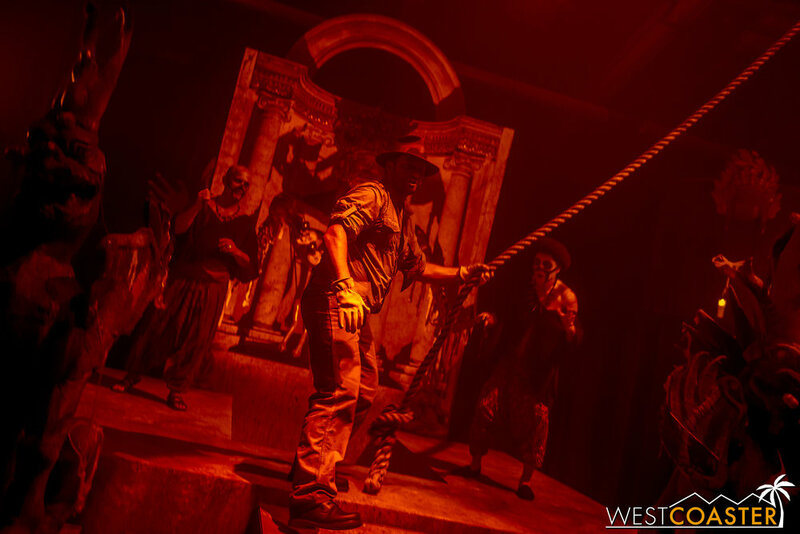 Running four evenings last year, October 26-28 and Halloween night, the 2018 Pageant of the Monsters was titled “Raiders of the Lost Art,” featuring a witty Indiana Jones theme. And what a fun event it was! 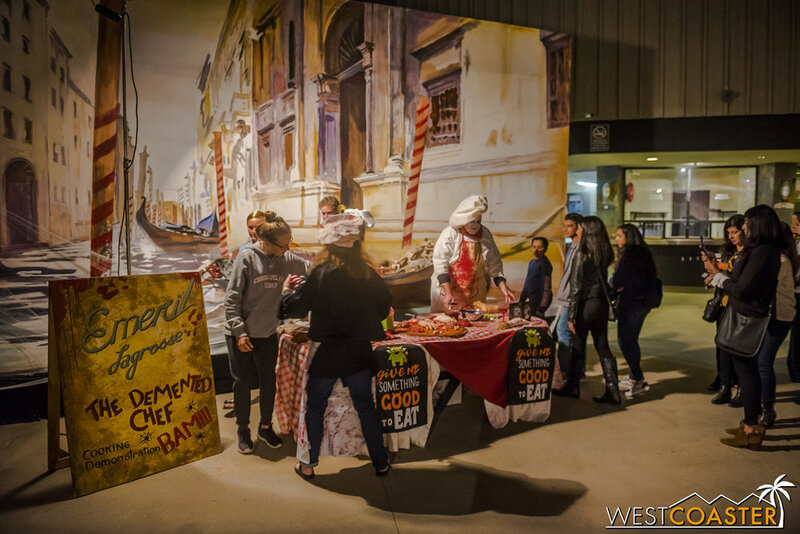 Limited to only a few thousand guests a night, it enjoyed great popularity throughout its end-of-October run. Lets take a look back at how this haunted attraction turned out, so that you can mark your calendars for the next time this event comes back—presumably in 2023, if the every-five-years pattern holds! 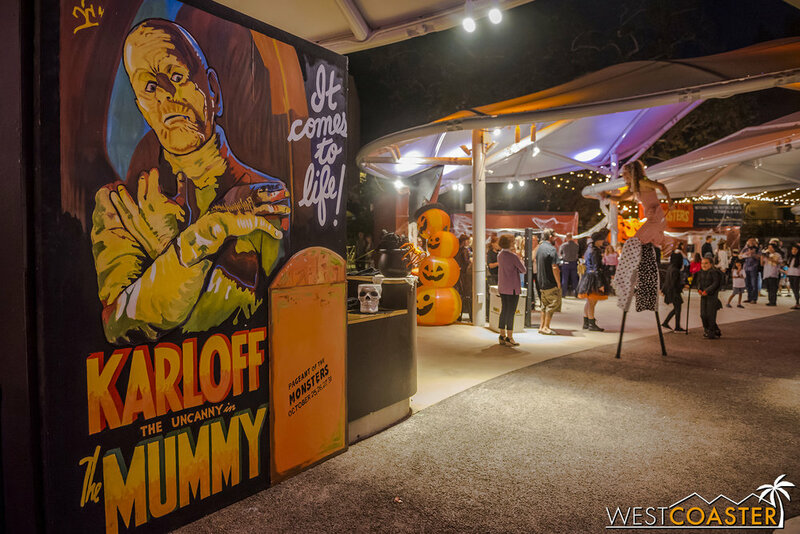 Similar to the Festival of Arts that runs every summer, the Pageant of the Monsters featured a general exhibition area, but with some more horror-related amenities. 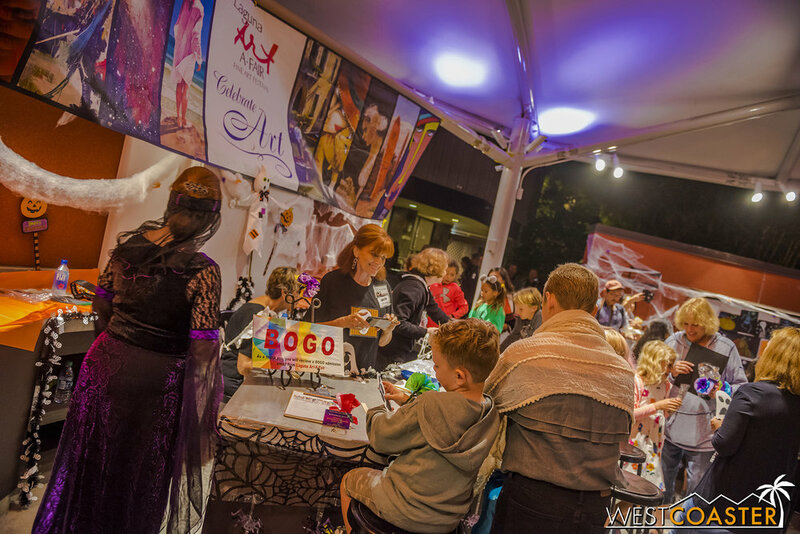 Unlike a lot of the Halloween events we cover, this production was pretty family-friendly. There was a warning that the Pageant of the Monsters wasn’t recommended for children 5 and under. But generally speaking, it was pretty light on the frights, especially outside of the actual haunted house experience. 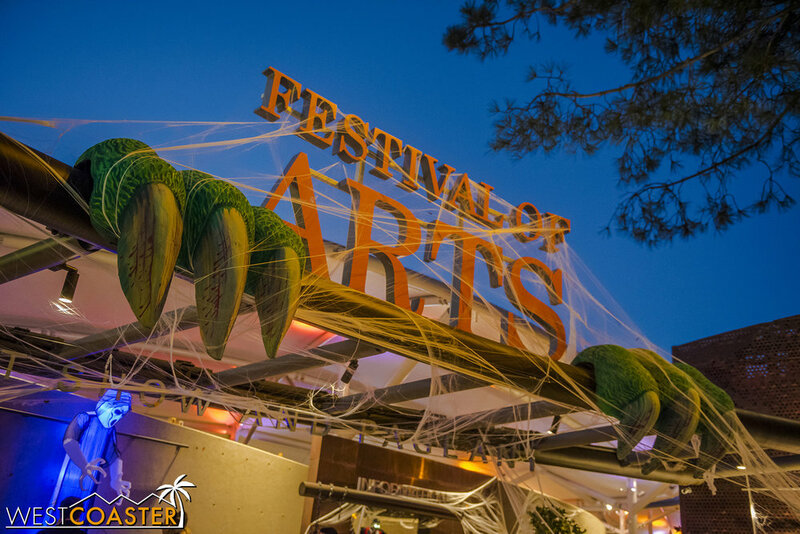 A pair of large monster claws accentuated a fantastically spooky version of the Festival of Arts. 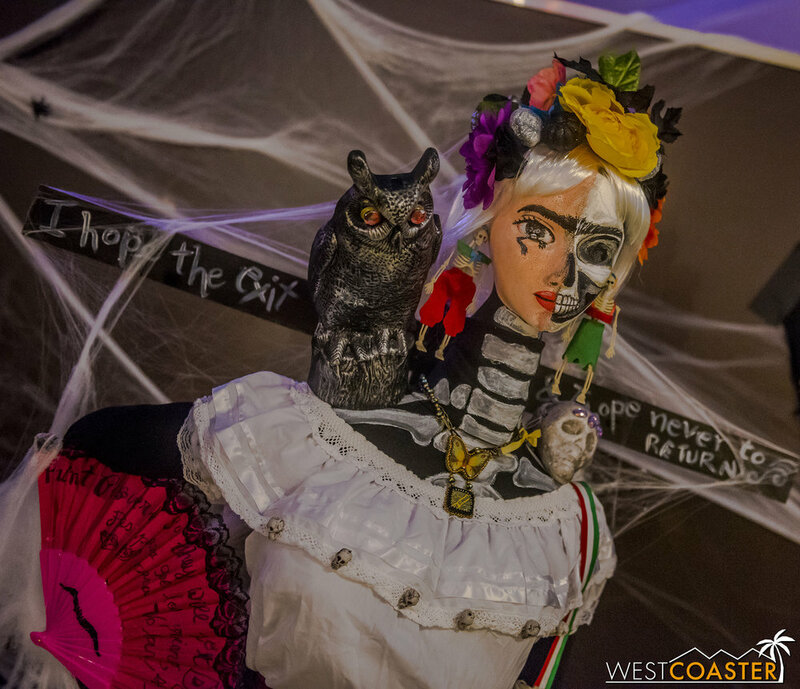 Cobwebs and Halloween theming covered the Irvine Bowl grounds, with festival merchandise, a reptile exhibit, some macabre but fine art photo ops, and even some arts and crafting activities featured. Here, the spirit was one of the togetherness and fun of Halloween, with an understood tongue-in-cheek approach at the eerie holiday. There was plenty of merchandise available for purchase. 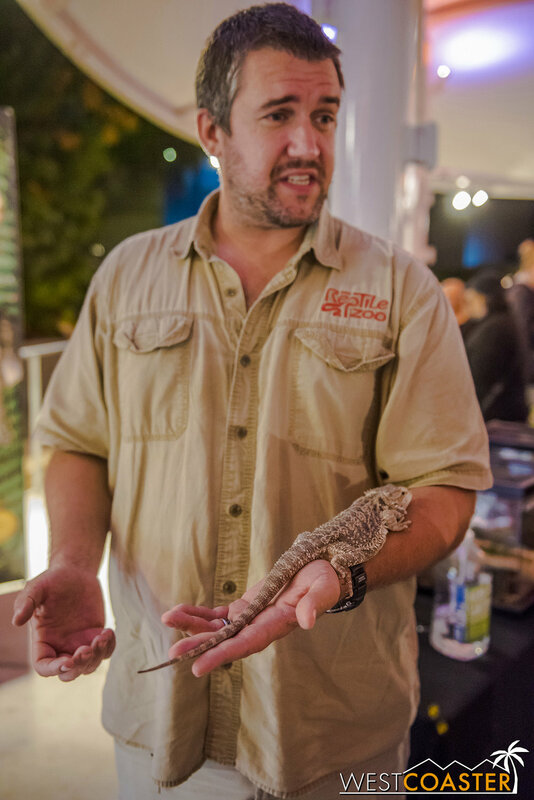 This reptile exhibit was one of several geared toward the autumn holiday mood. 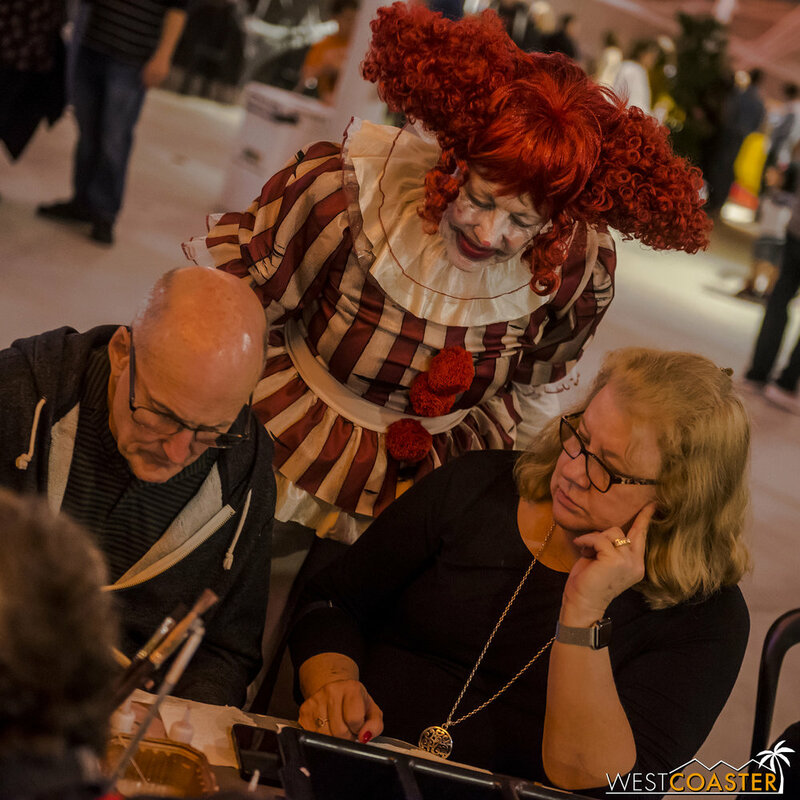 There were also a few roaming clown characters, cultivating the festival atmosphere. Though clowns are often used in Halloween events in a scaring capacity, these were more of the carnival clown variety, behaving in silly manners more than startling. 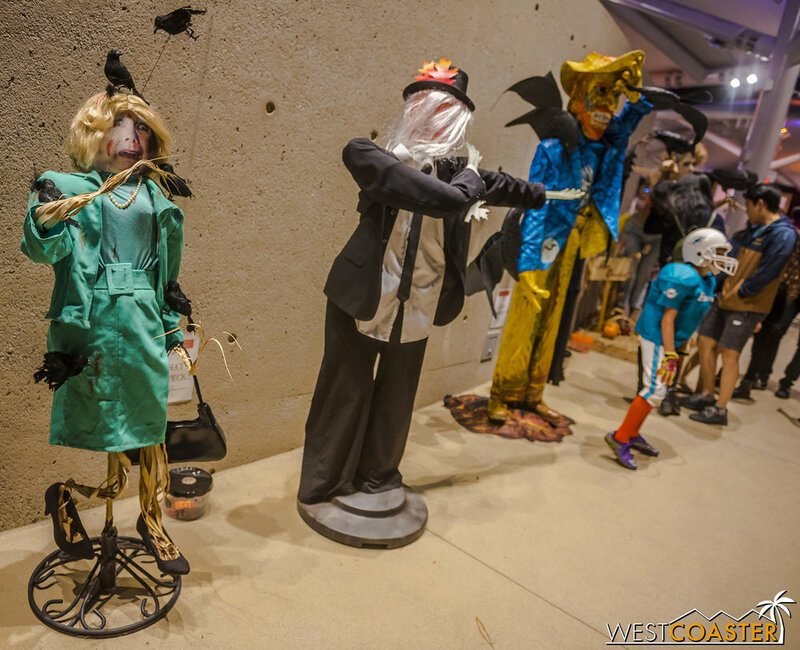 Along the entrance way into the event, there were also sculptural “scarecrows” on display. 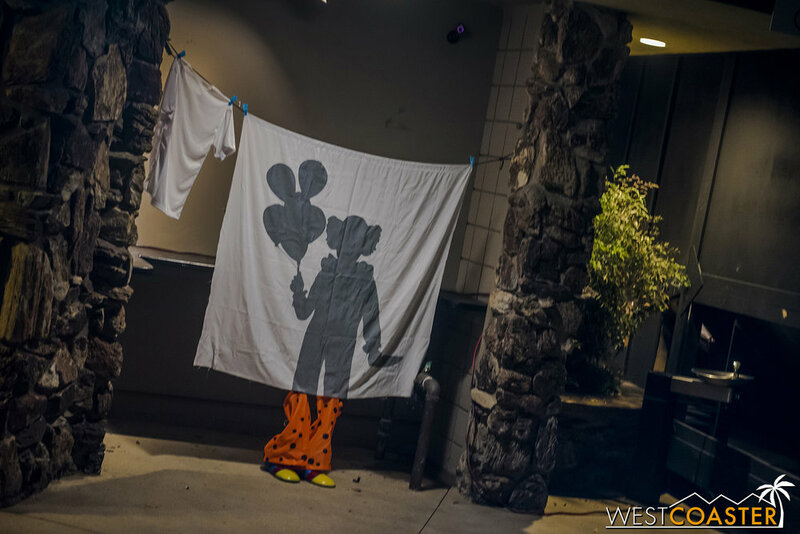 These were part of an interesting art contest featuring entries by local Laguna Beach residents that put their own spins on what the Halloween scarecrow might look like. Some of the creations were certainly fiendish, while others were odd and unnerving. Guests were given a ticket to vote for their favorite, and the winner was announced on the final night of the run, October 31st. It was pretty cool to see the artistry on display, and the scarecrows also provided photo ops for incoming guests. 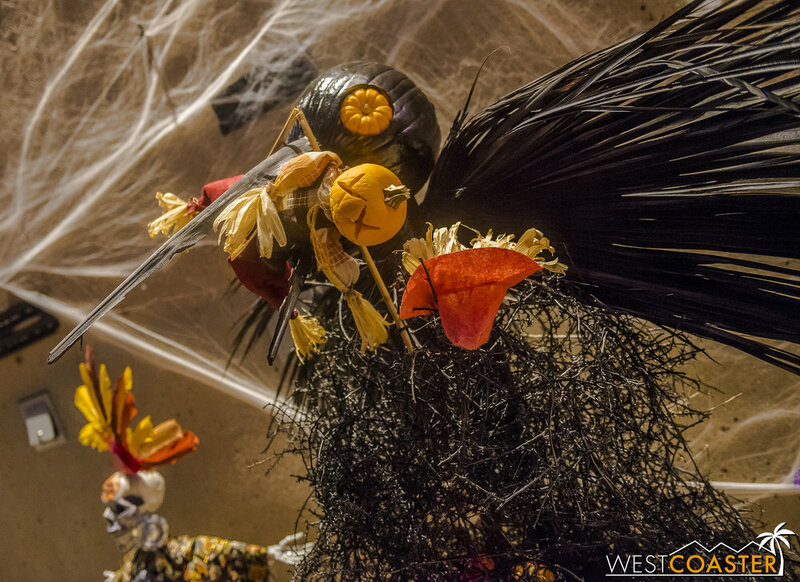 The “Conflagration—Demon of the Santa Ana Winds” scarecrow was my personal favorite and a very popular overall visitor favorite. Joan Crowford struck me as a little disturbing, but I guess that’s the point of a scarecrow! 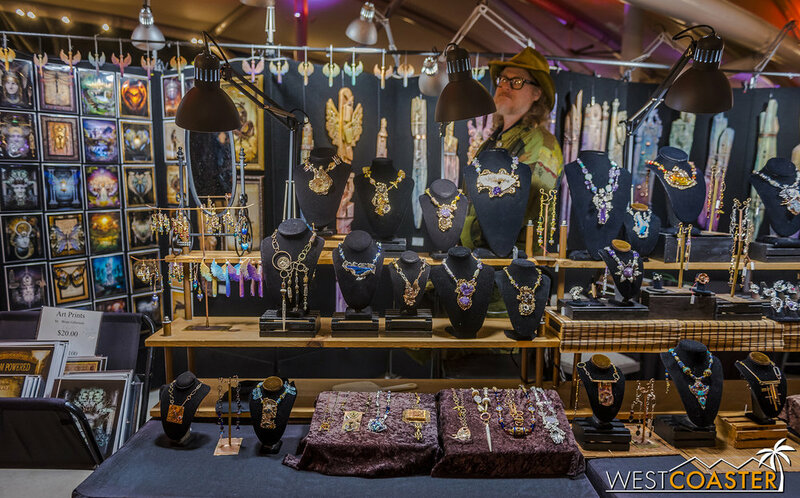 In addition to everything above, the Halloween edition of the event also featured a condensed Festival of Arts gallery display, with various artisans displaying and selling their wares. 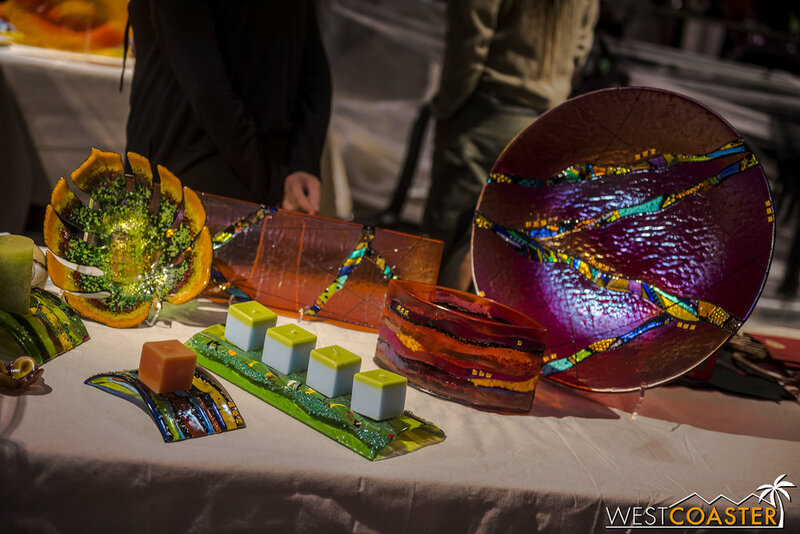 Jewelry, paintings, and sculptures were available for guests to admire and purchase. It was a great opportunity for the local residents to gain bonus exposure beyond the regular summer Festival of Arts time period! The art gallery was much smaller in October than during the summer, but there was still a fair amount to see! Of course, the main attraction was the haunted house itself, which had lines that stretched 30 minutes to an hour at times. 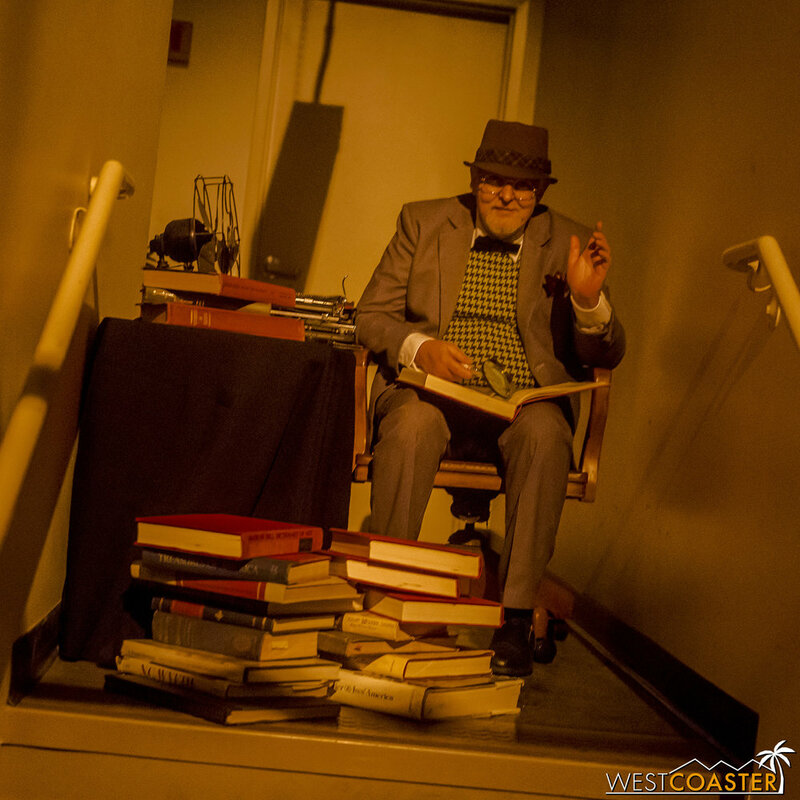 The “Raiders of the Lost Art” theme followed one “Cincinnati Smith” as he explored some far off locales in search of priceless treasure. These would really fall in the form of scenes utilizing backdrops and characters adapted from previous Pageant of Masters shows, giving a really cool, up-close look at the theatrical process. Oh no! It’s Emeril Legrosse, the demented chef! Guests in line were given the opportunity for a sinisterly fun photo op with Emeril Legrosse, the “demented chef,” before entering the haunted house experience in proper. In typical elementary school haunted house style, there were food bits masquerading as organs and other disturbing bits. But in keeping with a family-oriented tone, everything was played out in a joking manner. A creepy native lurks in the shadows of the foliage. 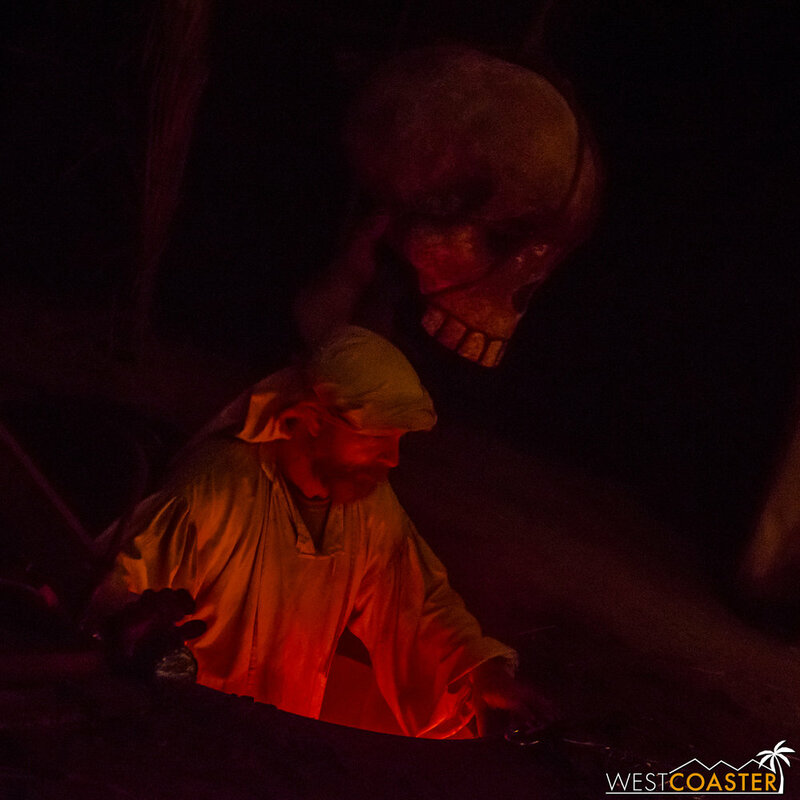 Cincinnati Smith contemplates how to accomplish his mission in this homage to the classic Raiders of the Lost Ark scene. 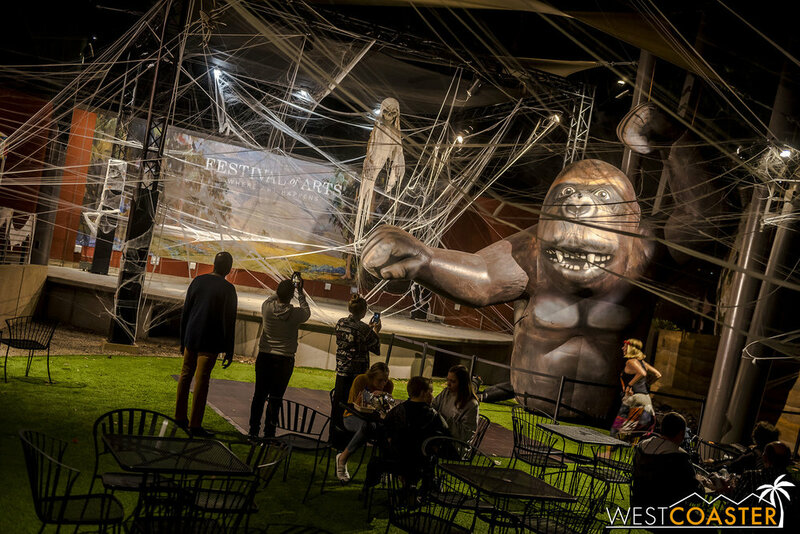 Guests then moved on through the Irvine Bowl seating area, with a wilderness setting projected onto the stage area, and more natives lurking in overlooking ancillary stage areas off to the side. Making their way from the high ground of the rear seating area to the lower front portion, guests actually were able to descend into the orchestra pit, where web-strewn, black-lit arachnid scene greeted them. Here too, there were some startle scare moments, as actors dressed in black moved the spiders suddenly, much to the shrieks of children and chuckles of their parents. 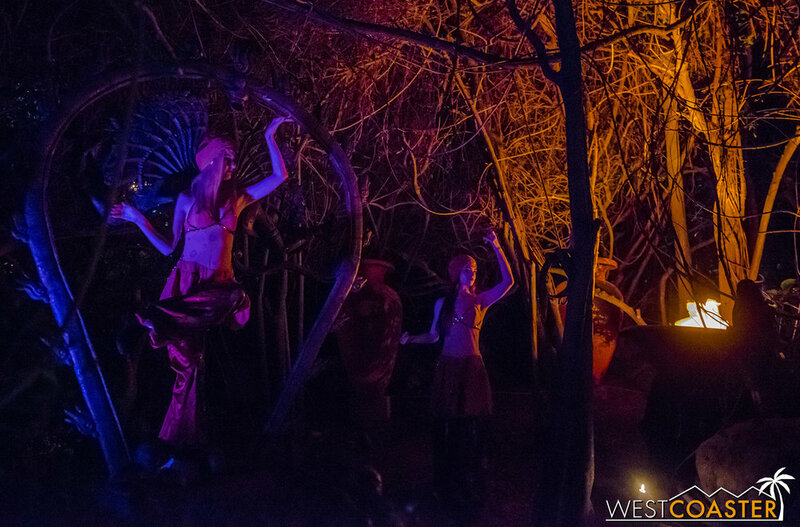 Dancers in the jungle firelight provide a curious display. 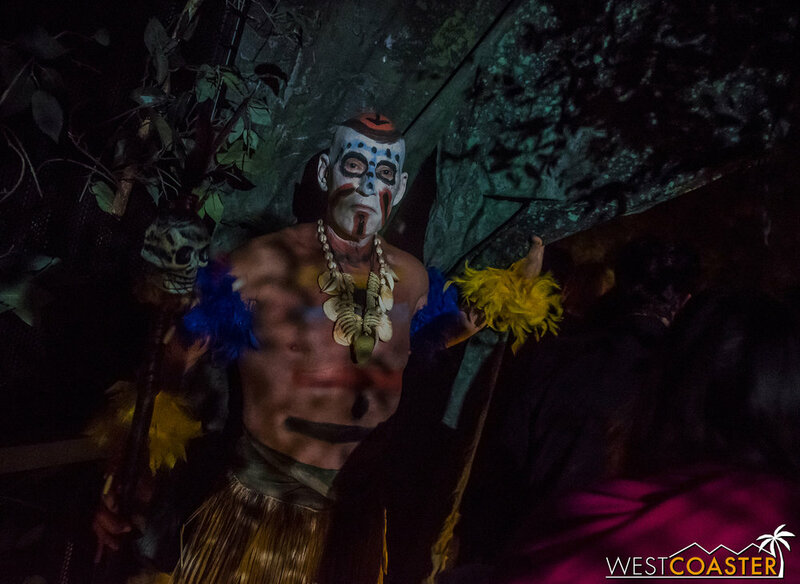 From there, guests passed by a dancing natives scene that reinforced the atmosphere of the savage wilderness bearing a hint of mystery and adventure. Then, it was time to head backstage and indoors. This is where the production—which was already laudable—picked up to an even higher level. The first room featured Cincinnati Smith, trapped in a temple setting, trying to escape from the natives who had surrounded him. Our hero dramatically swung a rope from an altar area to a side passage, evading the attacking natives. Much like any well-done haunted house, the theatrical lighting, engineered soundtrack, and actors themselves were fantastic. The scene was set up more to observe than to interact. Like most of the haunted house experience, the actors did not try to actively scare the guests. Instead, the intention was to create a heightened ambiance of peril. 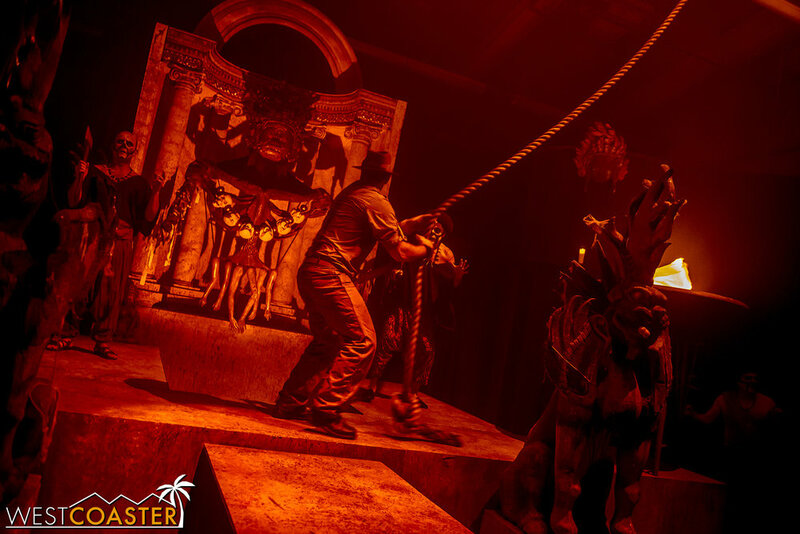 We encounter Cincinnati Smith again in a temple, running from more hostiles. This continued throughout several scenes. A scene of relics and ruins was next, with a creepy hag queen eyeing guests as they passed by. The treat was the visual spectacle presented to the pedestrians. The Pageant of Masters has certainly built up an opulent collection of backdrops, props, and furnishings over the years. These were perfect for creating environments that an Indiana Jones-type character would explore. I loved scenes like this, which featured luscious lighting and unnerving actors. The narrative remained relatively lose throughout. I didn’t get much sense of a plot progression as much as this was a series of scenes, but they were each moody and darkly enigmatic. Some seemed to relate to classic mythology… of muses and serpents and spirits. Others played off more of the settings found in adventure movies—archeological sites and ancient ruins. This excavation scene culminated in a surprise startle scare for the unlucky passer by. There was also an oddly placed classroom scene featuring students listening to an archeology lecture. Perhaps this was Cincinatti Smith after returning from his adventures? It didn’t matter much. Again, the experience was laden in the rich settings that the event designers had conjured up. The professor lectures in a college class. 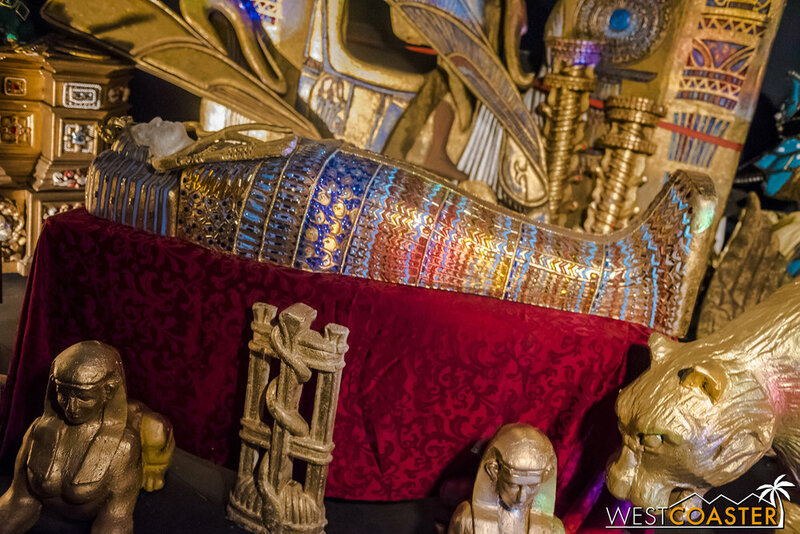 The big culmination was a magnificent treasure room, full of golden sculptures and glittering jewels, and an apparent German nemesis claiming that all of this was hers—but then admitting not really. Again, nothing was too serious, and even it was, most guests were too busy being agape at the amazing scenes in front of them. 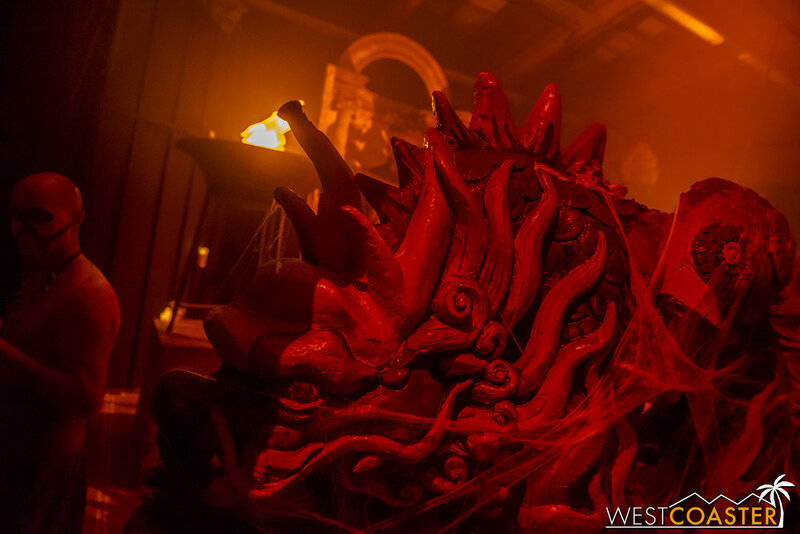 Treasures untold await guests who reach the end of the haunted house! 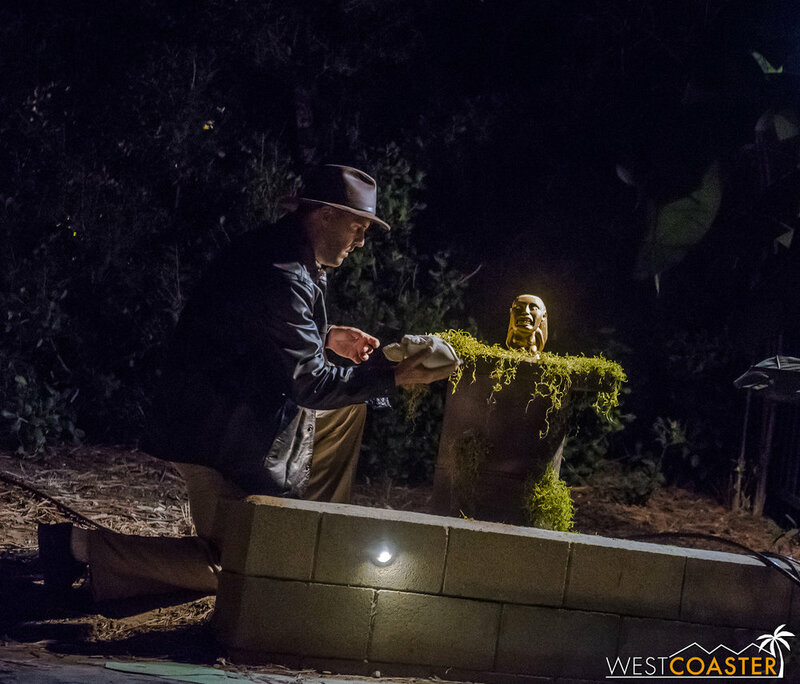 The Pageant of the Monsters was a devilishly fun event, featuring some light scares and heavy production that showcased just how spectacular Laguna Beach’s artistic heritage and community can be. 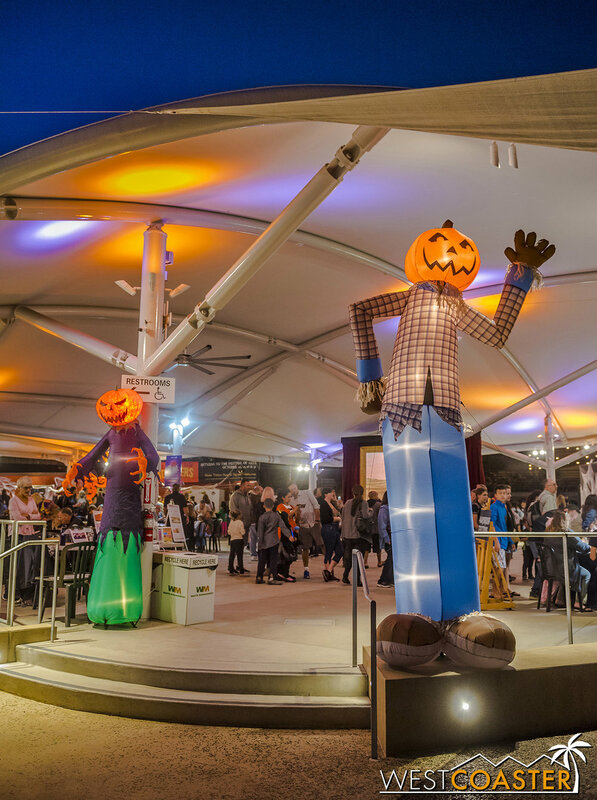 In crafting an entertaining and playful event that children and adults could enjoy, this production provided a unique and wonderful contribution to the Southern California Halloween landscape. It’s a shame that the Pageant of the Monsters runs so many years apart, as there certainly seems to be enough material to provide for an annual event. But then again, that would probably take away a little from the special-ness of the event, and also require even more time from the event organizers and participants who already sacrifice and volunteer so much of their efforts toward the regular Pageant of the Masters. Ultimately, the Pageant of the Monsters was a dazzling and uncommon highlight of last year’s haunt season. We can’t wait to see what they brew up the next time around!